Explore Nunavut - Qikiqtaaluk Region - Explore Canada's arctic! 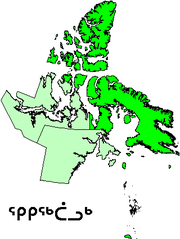 Qikiqtaaluk Region or Qikiqtani Region (formerly called the Baffin Region) is a region of Nunavut. It consists of Baffin Island, the Belcher Islands, Akimiski Island, Mansel Island, Prince Charles Island, Bylot Island, Devon Island, Cornwallis Island, Bathurst Island, Amund Ringes Island, Ellef Ringes Island, Axel Heiberg Island, Ellesmere Island, the Melville Peninsula, the eastern part of Melville Island, and the northern parts of Prince of Wales Island, and Somerset Island, plus smaller islands in between. Auyuittuq National Park is a national park located on Baffin Island's Cumberland Peninsula in Nunavut, Canada. It features the many terrains of Arctic wilderness, such as fjords, glaciers, and ice fields. In Inuktitut - the language of Nunavut's Aboriginal people, Inuit - Auyuittuq means "the land that never melts". Although Auyuittuq was established in 1976 as a national park reserve, it was upgraded to a full national park in 2000. Little vegetation can be found in Auyuittuq Park, although the plants that are found there range from flowers such as Mountain Avens, Campion, Papaver, and Saxifrage to shrubs like Dwarf Birch, Arctic Willow, and heather. Many of the plants in Auyuittuq Park grow in clumps to create their own warmer "microclimate" to survive the harsh arctic conditions. Because of the exceptionally low vegetation supply, wildlife is very scare. There are only 12 species of mammals that live in Auyuittuq Park and these range from Lemmings, Arctic Hare, and Ermine to Polar Bear, Arctic Fox, and some Caribou. The nearest towns are Qikiqtarjuaq and Pangnirtung. The most common backpacking route in the park is along the Weasel and Owl Rivers via Summit Lake. Well known peaks include Mount Asgard (shown in the James Bond film The Spy Who Loved Me) with an 800 meter (2625 foot) face, and Mount Thor with a 1,250 meter (4,100 foot), 105° face. Sirmilik National Park is a national park located in Nunavut, Canada. Meaning "the place of "glaciers" in native tongue, Sirmilik was established in 2000. The park comprises tree areas, the Bylot Island, Oliver Sound and Borden Peninsula.